So what is it about Jesus that makes him so nearly-universally loved… at one level or another? I think Frank Schaeffer hits the nail on the head in this great article found here. It’s short and I really encourage you to read it, wherever you are on the Christian or spirituality “spectrum” (including atheism… Schaeffer is not here critiquing atheism). Just be sure you get to the last paragraph. It succinctly puts the welfare of each of us and of the world in a grand but practical light, based on the person and message of Jesus. All I wish to add is a little about Frank Schaeffer for those who may not know of him. Perhaps the most significant thing in relation to this kind of article (only one genre and subject of many by and on which he has written): He was raised in a strongly Evangelical family by well-known parents, Francis and Edith Schaeffer. Francis was a very popular Christian apologist/philosopher, mainly of the 1960s to 1980s, who influenced not only many individuals but one might say the entire American culture toward a relatively conservative (not literalist, but close) brand of Christian faith and Christian involvement with culture, including politics. The politics aspects, not the real core of his broader work, was in the later phase of the senior Schaeffer’s ministry. In this, Frank, as a young man, joined and pushed his father along. 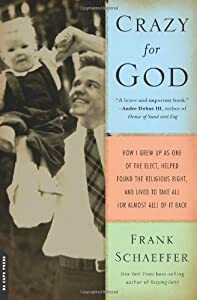 Frank has written about his experiences in this phase (and “taken ‘nearly all’ of it back,” as to his part) in the book Crazy for God and other books. He has written some popular novels, many articles, made many TV appearances, etc. Frank remains a Christian within the Greek Orthodox tradition, but certainly an “unorthodox” (small “o”) Christian. ← Are Millennials Pushing Church Attendance Down? If so, Why?